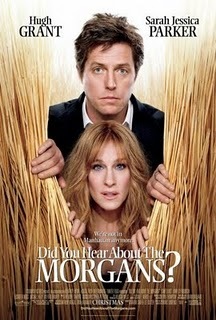 Josh Hylton's Movie Reviews - Reviews - Did You Hear About the Morgans? Did you hear about Did You Hear About the Morgans? No? You have no idea how lucky you are. It's the newest romantic comedy starring Sarah Jessica Parker and Hugh Grant that is being released this week as counterprogramming to Avatar. Think about that. Avatar is the most anticipated action spectacle of the year, so you have to have some pretty big balls to put any movie opposite it, but if you are, you might as well make it the dumbest, cheesiest chick flick you can to appeal to the ladies who aren't interested in James Cameron's visual feast. I hope you're single this week fellas because you're going to look like tools walking into this mind numbing rom-com. The film follows New York real estate broker Meryl, played by Parker, and Paul, played by Grant, as they are going through a separation. Paul has evidently cheated on Meryl, but he's desperately sorry and wants to get back with her, so he asks her on a date so they can talk things out. On their walk after the date, they see a man get killed from his balcony and fall onto the city streets below. They try to hide, but his killer spots Paul and Meryl. After an attempt is made on Meryl's life, she and Paul are placed into the Witness Relocation Program. Where are they sent? Why, to the most hum dinging, gun slinging, rodeo watching, hoe down dancing place on the planet, Ray, Wyoming! And they're New Yorkers! What a humorous turn of events! Hmm, I wonder if Paul and Meryl will rekindle their relationship and come to love the small town? Did You Hear About the Morgans? is a trite, unnecessary time waster that spends most of its time joking about the stark contrast between the two New Yorkers and the country folk. Meryl is a member of PETA, so naturally she is sent to a family who has dozens of animal heads adorning their walls. When her hostess asks her, "Are you a hunter?" she replies with, "Just for bargains." Ho ho, look out now! The biggest problem with most of the jokes is that they are telegraphed seconds beforehand. Comedy is effective for many reasons, but one important reason is the element of surprise. If you know which jokes are coming, the comedic punch is all but taken out, yet I could have quoted around half of the jokes in this movie as they were being said. Partially due to contrivance and partially due to Meryl's own stupidity, the killer finds out where they are and travels to Wyoming to take them out, which culminates into one of the dumbest, most anti-climactic endings of the year, where (spoilers!) the killer is taken out by a horseshoe perfectly thrown to land on his head. This is followed by a hackneyed dialogue from Meryl about how much she loves Paul, a small sample of the film's overall terrible writing. What I really hated in Did You Hear About the Morgans? was how unaffecting the conflict was between Meryl and Paul. What they did was create this arbitrary struggle between the two so they are at odds at the beginning of the movie, but they want us to like Paul. He cheated on his wife! What's to like? I was supposed to feel bad for Paul's desperation. I didn't. Of course, later in the movie, you find out (spoilers...again!) that Meryl slept with somebody else as well, which creates even more tension between the two. Why? Paul has no right to be angry at her after what he did. I hate these types of movies because there are no rational characters. Boy, is this a bad movie. While the actors do their best, especially Grant who still manages to squeeze some of his natural charm into this unfunny wasteland, nothing can save it from its low ambition and sloppy writing. Did You Hear About the Morgans? I wish I hadn't.